So...I mentioned a while back that I would eventually post a deck list, so here's one. I won't be posting a list because I am under the assumption that most (if not all) of the cards in the image are common knowledge...that, and I don't have a lot of time to write down the entire list right now. The objective is to Fusion Summon (obviously) Deadlyguy and place cards such as Dynamiteguy, Celestial, and Malicious into the graveyard to abuse their effects. 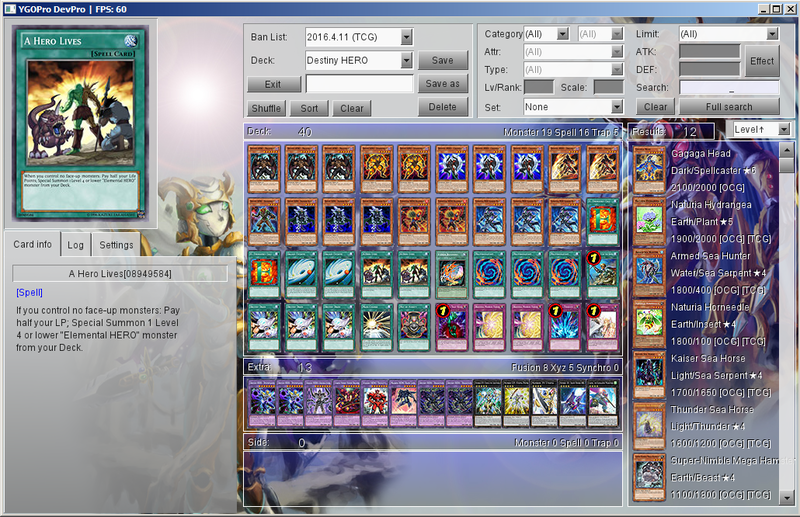 Despite what many say, Dystopiaguy is pretty decent in this deck, especially when used in conjunction with Deadlyguy. While it is fairly consistent, it does have some issues. Card of Demise slows things down (unless used by Diamond Dude), and it sometimes bricks...terribly. Like, I could make a house out of it. Last edited by Yuuri; 8th August 2016 at 09:58 PM. Why Drillguy should be cut off ? He can make Starve Venom Shenanigans and gives acces to Rank 4 stuff. Last edited by R3QU13M; 31st July 2016 at 05:11 AM. To be honest, I forgot that card even exists. Also, I love that old combo. Even so, I can't seem to find the room for King of the Swamp. At least, not at the moment. I'll attempt to clean up the deck and post an image later. I have one in there. But as much as I like Blazeman, his effect to add Polymerization to the hand restricts you to Fusion Summons during that turn, which isn't a bad thing unless you lack the proper materials, which I found myself without the proper materials whenever I drew Blazeman quite often, strangely enough. Plus, I hate how the deck currently has no means of Special Summoning Blazeman, so I'm stuck using up my Normal Summon just to add Poly to my hand. Nevertheless, I may remove it for King of the Swamp. I've tried Ties of the Brethren before. It's a little too slow for my liking but it does have its uses, so I may try incorporating it again. If anything, it might be good with D - Fusion. I'll be honest, Juragedo sounds like fun in this deck. I'll throw in 1-2 and see how it works. I was considering using some Rank 4s, but couldn't really find the room. I'll probably drop a Dystopiaguy, Trinity, and the Rank 6s. Also, I knew I was forgetting something important. Starve Venom is too good in D-HEROs, in my opinion. Thanks for the tips! I'll make some changes and post an image up later on. Last edited by Yuuri; 1st August 2016 at 11:12 PM. It's Blazeman's second effect that restricts you to Fusion Summons only for the turn. Also, if you already have Poly in hand, you can use Blazeman's second effect to send Shadow Mist to the graveyard, making him Dark while Shadow Mist searches a D-HERO getting both materials for Deadlyguy in one go. You are limited to only Fusion Summons for the turn though so you can't go into Rank 6s with Deadlyguy and Malicious. Last edited by pyrQ; 2nd August 2016 at 09:05 AM. Ehh, I still hate the fact that this deck cannot Special Summon Blazeman, but I guess I will run him again. Maybe he'll fill in one of the missing pieces of the deck. On the other hand, I haven't found the time to upload a new deck image lately. But thanks to that, I found that certain cards aren't very useful in this build (or they don't help the deck function in the way that I would like.) I'll attempt to make edits and post them up by Sunday. Last edited by Yuuri; 7th August 2016 at 04:18 AM. You can use A Hero Lives to special Blazeman from deck.